Considered to produce Greece’s finest white wines (if not the world), Assyrtiko was first cultivated on the island of Santorini, where it has developed a unique character producing excellent wines. Unique among white wine grapes, Assyrtiko has the ability to maintain its acidity as it ripens. It yields a bone-dry wine that has citrus aromas mixed with an earthy, mineral finish due to the volcanic soil of Santorini. In the last 25 years Assyrtiko has been planted throughout Greece including Macedonia and Attica where it expresses a milder and fruitier character. However, the world class Assyrtiko wines come from Santorini. Athiri is one of the most ancient of Greek grape varieties.The name of the grape indicates its origin from the Island of Santorini, also known as Thira, where it is used together with Assyrtiko and Aidani for the production of Santorini wines. Athiri is found in other regions in Greece including Macedonia, Attica and Rhodes. 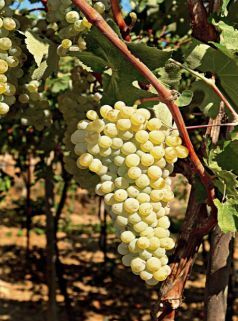 Athiri grapes have a thin skin and produce sweet and fruity juice and slightly aromatic wines with medium alcohol content and low acidity. Malagousia grows mainly in Northern Greece and is now cultivated in some vineyards in Attica and the Peloponnese. The winemaker Gerovassiliou was the first to experiment with the nearly extinct Malagousia grape, realizing its vast potential for producing high quality wines. It is an especially aromatic grape leading to elegant full bodied wines, with medium acidity and exciting aromas of exotic fruits, citrus, jasmine and mint. A light pink-skinned variety used to produce lively, crisp wines as well as richer, fuller-bodied versions, most of them best suited for drinking on the young side. Usually intensely fragrant, even pungent, with bright citrus character, this varietal’s “home” is in the Mantinia region of the Peloponnese. Known as Ribolla in Italy, Robola is grown most notably in the mountainous vineyards of Cephalonia, an island in the Ionian Sea. The noble Robola grape yields distinguished wines with citrus and peach aromas mixed with smoky, mineral hints and a long lemony finish. Roditis is a rosé colored grape that is very popular in Attica, Macedonia, Thessaly and the Peloponnese. It shows best when cultivated with low yields on mountainous slopes. Roditis produces elegant, light white wines with citrus flavors and a pleasant finish. The most widely planted grape in Greece, Savatiano historically was synonomous with Retsina and now is used to blend with other higher acid grapes to produce elegant, well-balanced white wines with aromas of citrus fruits and flowers. Vidiano is an ancient white-wine grape from the Greek island of Crete. 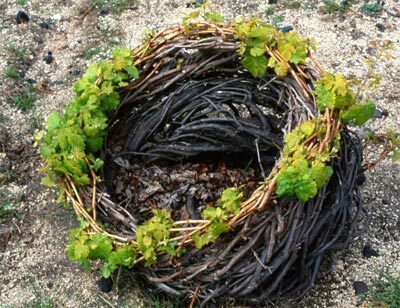 Although there are very few Vidiano vines left in existence (the variety was all but extinct less than 25 years ago), there are now signs of a small-scale revival. Typical Vidiano wines are medium- to full-bodied, with acidity that is remarkably fresh (given the warm, humid climate they come from) and a relatively broad spectrum of fruit flavors – such diverse descriptors as lime, quince, peach and even mango appear in Vidiano tasting notes. Most producers try to unlock the true potential of the grape, planting it in cooler high altitude vineyards or blending it with other varieties, like Vilana. 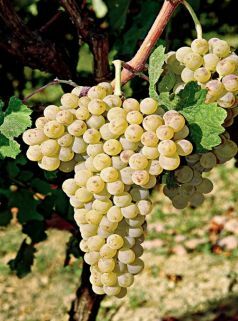 Vilana is a white-wine variety grown primarily on the island of Crete in Greece. It is traditionally a workhorse variety, making light, delicately flavored varietal wines with citrus and floral characters. However, enterprising producers are experimenting with oak-aging and blending with international varieties such as Sauvignon Blanc to create more interesting wines. Most of these grape varietals are Greek to me…….nice to learn about them!